Why is the 2nd note of a chord called major third? On a piano, the root note of the C major chord is referred to as 1. The second note played is E, which is actually the fifth key when starting at C. Not 3? Yes this makes senses to call it a 3 when referring to written music, but written music is confusing because the white and black notes are unevenly placed on 12 notes of each octave. A minor chord would be less confusing if though of as 1,4,8. After many attempts to look into music theory and understand chord combinations this now makes sense to me. Using numbers to refer to the next note on the instrument I'm playing — guitar or piano, not some complicated stave of circles in lines that makes me feel dyslexic. It's more about context than it is about written music. It's called a third because it's the third step in the scale. Take the C major scale for example. The C major chord is C E G: the first, third, and fifth steps (degrees) of the C major scale. The C minor chord is C Eb G: the first, third, and fifth degrees of the C minor scale. This is the simplest way to see it, but you can also see it as intervals, which are based on the distance between two notes. From this you can also notice that the second note of a chord is not always a major third. It can be a minor third, or anything else. The C minor chord has a minor third, for example. As you can see it's not a complicated stave of circles in lines, it's much simpler. So, why use interval notation instead of your suggested notation? Because it takes into consideration the context, the scale, the key, which actually simplifies things a lot (even if you can't see it now). Your suggestion only uses the root as the reference, but nothing more. Look at the C major and C minor scales again. In both cases the third note of the scale is the second note of the chord. Both are thirds (a major third in the major chords, and a minor third in the minor chord). 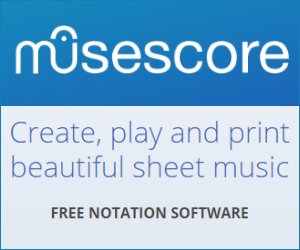 This link is not present in your suggested notation, in which a major third would be a "5", and a minor third would be a "4". That link is very important, because in tonal music everything gravitates around something (the key), everything functions in relation to something else. The interval notation implies these relationships, making things more clear and simpler. Once you start seeing things in terms of tonality, once you dive into music theory, this will become evident. It's intriguing that you mention this, because your suggestion that we call a major triad 1,5,8 is very close to how musical set theory works. In set theory, one of the primary goals is to classify harmonies as objectively as possible without privileging any scale (or indeed the entire idea of key and enharmonic pitches). The only primary difference is that the first number set theorists use is 0 instead of 1. Faced with a major triad, a set theorist would say that the "normal form" of the simultaneity is . (NB there is variance about when to use square brackets or other kinds of brackets). They would go further, and say that the "prime form" is (037), but the explanation of that is complicated and belongs in a different question. Much of our western music is based on several common scales which all have only 7 distinct notes and not all 12. Many chords are then formed relative to notes found in any given scale. So the relationships between notes is not from one note to the next one of the 12 notes, but to the next or another note within a certain scale. Intervals, upon which chords are constructed, are named for their relative distance from one letter to another letter. The distance from the letter A to the letter C never changes. If A is the 1st letter, C is always the 3rd letter. It does not matter if the letters are flat, sharp, or natural the distance from A to C is always the same. The interval numbers 3rd, 4th, etc. become independent of any scale or key. The terms major, minor, perfect, diminished, and augmented come to play in relationship to a given scale. This question seems not so much to be about the reasoning behind the nomenclature of standard Western music theory (the OP already seems to have an adequate answer in mind, despite some some confusion about the staff system), but instead about representation of music in general and what feels "natural." I venture that the most significant factor behind the question is level of comfort with traditional Western notation. The reasons behind this notation (and just why the 2nd note of a chord is called the major third) are more a historical matter than a philosophical/logical one, i.e. it ain't science, it's art! If you first come to music by picking up a guitar or playing piano by ear, you are more likely to develop you own conceptual apparatus for working through the peculiarities of note layout on those respective instruments. There are some advantages to this, but it may make traditional music theory at times seem convoluted (see https://en.wikipedia.org/wiki/Enharmonic for a classic case in point). @PatMuchmore makes a good point, and the OP might follow up on this and find the classification system used in musical set theory more intuitive and appealing for his purposes. Thankyou all very much for your answers. This is all very much appreciated. I think the reason i have struggled to understand music theory and written music for so long is because of its dominance within music teaching emphasizing so much information that could have easily been explained in terms of what is on the instrument, 12 notes, not 7. There are many scales from western to eastern, and many different types of instruments but most are tuned to these key 12 notes. The guitar doesnt have black notes so a c# has no distinguishing visible difference where as the piano which distinguishes very clearly non flats and non sharps on the white keys. If i want to learn an eastern scale it is easier for me to think in terms of a sequence of number combinations than trying to read a stave of a letter plus a sharp or flat variation. There is simply one logic, not two. I think this is a question one could actually write a book about. In my opinion, coming from the piano, you are already approaching that from the wrong end (historically). The 12 well-defined semitones are a compromise, dealing equal distribution for perfect harmonics, while having the error as small as possible. Where we're actually coming from is a world of whole-number ratios like 1:2 for an octave, 2:3 for a quint, and so on. This gives pure-sounding harmonics, the 12th-root-of-2 steps implemented on a piano do not. What historically evolved was the diatonic scale of 7 steps (or 8, if you want to count in the octave), based entirely on whole-number ratios. Depending on which step you start, you get a major scale, a minor scale, or even 5 different possibilities (like doric ... should probably not be discussed here) that lost their relevance nowadays. In this system, you have 2 possibilities for a third step -- a smaller or a bigger one (being the major or the minor third). Also note the third was perceived dis-harmonic for a long time, while nowadays, even seconds or sevenths might sound harmonic to our ears. The actual problem with a pure diatonic scale is that it results in slightly different notes, depending on at which step you start. That's why you have these 12th-root-of-2 semitone steps on instruments with discrete tones. they are the best approximation distributing the error equally. So my bet for an answer: In a world of 12-tone-music, your suggestion would match. But then, in this world, something like major or minor lost its meaning anyways. Talking about major or minor chords, just think in terms of the diatonic scale and keep in mind instruments like a piano only approximate it. Not the answer you're looking for? Browse other questions tagged theory terminology intervals or ask your own question. Why do the Canadian and American ways of writing chords symbols differ? What is a chord with a diminished third called? Why is a major second not called a perfect second? Why call a major second a diminished third? Why is sheet music confined to a key? Why the interval of 2 tones is called the third?